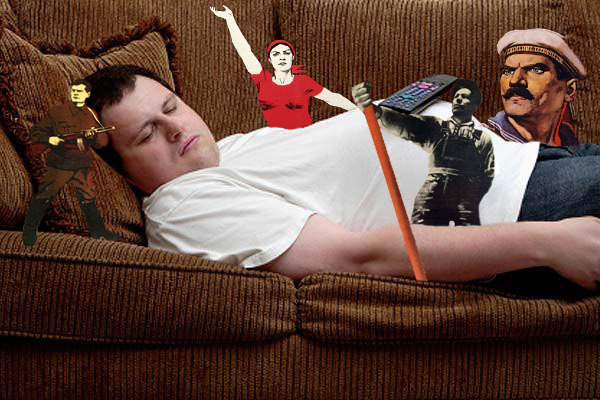 “Damn Provocateurs vs. Couch Potato Liberals.” Images mixed by Kevin Rothrock. There are very different kinds of nationalists in Russia. As the label implies, they’re all concerned with protecting the interests of the Russian people, whom they define in various terms: ethnicity, language, culture—you name it. With so much concentration on constructing a better “imagined community,” you might expect Russian nationalists to be of one mind about the Ukraine crisis. When it comes to the current unrest in the Crimea, however, nationalism produces wildly dissimilar views about what Russia ought to do. Even basic disagreements about Russia’s next steps in the Crimea are possible among Vladimir Putin’s most vocal critics. For instance, since the beginning of the political crisis in Kiev, Egor Prosvirnin, author of the nationalist blog “Sputnik & Pogrom,” has cheered the idea of reintegrating Eastern Ukraine into the Russian polity. Today, February 28, 2014, as rumors about a Russian military intervention in the Crimea flooded the news, Prosvirnin celebrated S&P’s longstanding support for restoring Russian sovereignty over the Crimea. Prosvirnin published an editorial [ru] confronting critics, who he says wrongly accuse his blog of “selling out” to the Kremlin. “Unlike many other publications,” he boasts, “we [S&P] are proud of the fact that we don’t change our views for decades.” Prosvirnin went on to argue that Russian ethnic unity is a necessary precondition for toppling Putin’s “authoritarian regime,” explaining that the fall of the USSR scattered ethnic Russians outside Russia’s post-Soviet borders, draining the “nation” of the lifeblood necessary for “successful, strong, and free development.” That is to say, the Crimeas of Russia’s periphery (also found in Belarus and northern Kazakhastan) must be regained, before Russians can challenge Putin effectively. 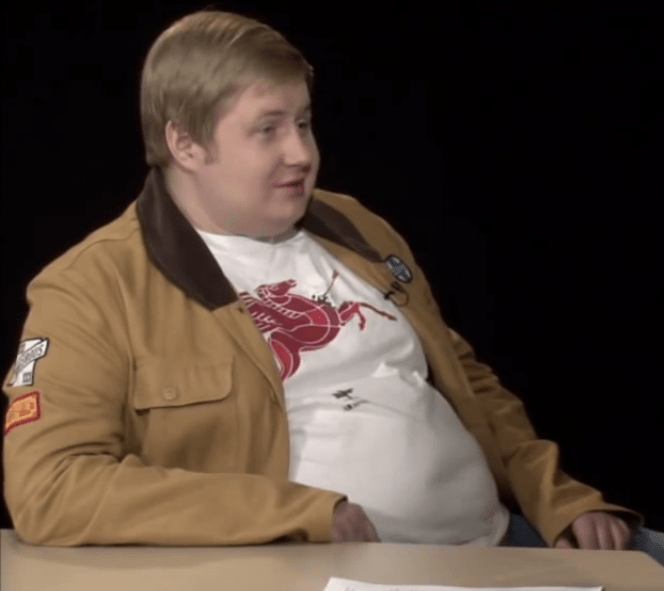 Egor Prosvirnin, interview screenshot, April 29, 2013, YouTube. While S&P is certainly an anti-Putin blog, Prosvirnin saved the best of his venom for fellow opponents of the Kremlin, attacking liberal democrats as “couch potato” dissidents who fail to appreciate that absorbing the Crimea would ultimately hasten the consolidation of the Russian nation (and therefore the downfall of the Putin regime). Milov, a former deputy energy minister of the Russian Federation, now heads the opposition political party Democratic Choice. A proponent of what he calls “liberal-nationalism,” he has participated in the “Stop Feeding the North Caucasus!” movement, a campaign to reduce federal subsidies to Chechnya and its neighboring areas, possibly with the eventual aim of jettisoning the entire region from the Russian Federation. On the question of the North Caucasus, Milov and Prosvirnin largely agree. Indeed, attitudes about Chechnya, and the related push to require visas for people traveling to Russia from the Caucasus and Central Asia, are the bread and butter of nationalist consensus in Russia. 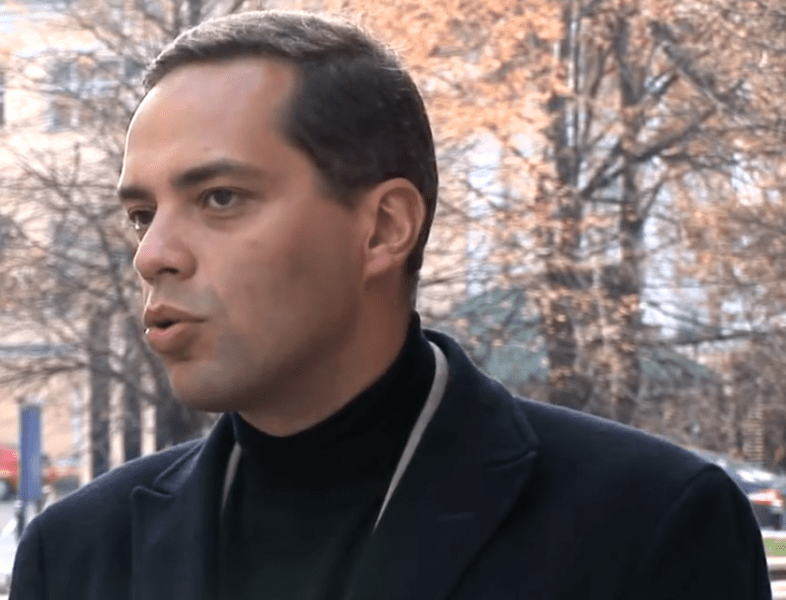 Kirill Rodionov [ru], another Democratic Choice figure, has published opinion articles in this vein, promoting the visa regime idea and the needs [ru] of the Russian ethnicity in broad cultural and economic terms. Rodionov has even published [ru] in Sputnik & Pogrom—eight times. How is it possible that one of Milov’s party allies collaborates with a man Milov says is a “damn provocateur”? Vladimir Milov, interview screenshot, October 31, 2011, YouTube. Milov’s apparent open-mindedness about this subject is curious, especially given his own position on the crisis in the Crimea, which he laid out in a February 24 Slon.ru opinion article [ru]. In that piece, Milov argued that Russians shouldn’t expect the Ukrainian elite—even in the Russian-speaking East—to embrace being “trampled under the boot of a Putin dictatorship.” Indeed, he denounces the Kremlin’s foreign policy writ large as “exporting dictatorship.” In other words, Milov rejects Moscow’s reabsorption of eastern Ukraine in part because of an inherently domestic issue: Russia’s unconsolidated democracy. The debate among nationalists over intervention in Ukraine oddly centers on opinions about the nature of Russia’s democracy. This is strange because nationalists in the Russian opposition tend to agree about the state of the Putin regime, condemning the Kremlin in unison as corrupt and unwilling to protect ethnic Russians. When it comes to aiding the Crimea, however, some (Prosvirnin) are happy to grab what they can today and democratize tomorrow, while others (Milov) insist on tidying up at home, first.